Hula Classes start this May in a 8-Week Course at New Farm State School‍‍‍. Your child does not need to be a student of the school. O'hana club teaches the Spirit of Aloha through Hawaii's traditional dance the Hula. 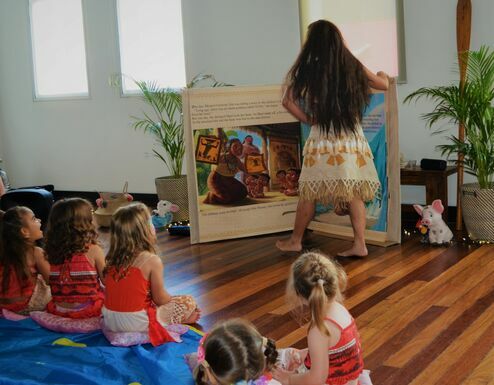 We nurture children's minds and create unforgettable memories for your children using the popularity of Moana as a vessel for a fun and educational experience. Please note that enrolment for this class is handled by the New Farm State Shool Community Education Program. • Warm Up - Before starting class we will have a fun hula hooping warm up! • Stretching - Important for all dancing disciplines! • Hula basics - We will focus on 1 of the 6 basics each week! • Choreography - In this 6 week term kids will learn a routine to a song from the Moana soundtrack! $125 for 8 week course. IMPORTANT: APPLICATION & PAYMENT DUE IN ADVANCE OF CLASS COMMENCEMENT DATE ENROLMENT Please visit the following website to enrol by clicking here‍‍‍.This is now our preferred booking method. If you need help let us know!